What Things Can Proper Dental Care Uncover? - Gernot H. Winkler, D.D.S. Your dentist may know more about your overall health than you or your family doctor does. During your dental hygiene appointments, the dentist can tell a lot about your health from the state of your gums, teeth, tongue, and saliva. They may be inspecting your mouth for gingivitis, but they are also able to detect serious health concerns. Getting quality dental care can be the difference between knowing you have a disease and treating it or not finding out until it’s too late. If you are interested in learning exactly what your dentist can find out from your teeth, then keep reading. The most common symptom diabetics share is gum disease. During your appointment with your dentist, they will check your gums for bleeding, loose teeth, and inquire about how long you have been suffering from these issues. People with diabetes tend to take longer to heal, so if you have been suffering from those symptoms for a while, it could be a sign of diabetes. You can be suffering from GERD and have no idea. Nighttime acid reflux won’t necessarily wake you up. The common mouth traits for GERD are an erosion of the upper back molars and irritation at the back of the mouth. Thankfully, quality dental care ensures those initial signs are noticed. GERD can lead to esophagus cancer and erosion. Your eating habits are clear to the dentist inspecting your mouth. People who suffer from anorexia are often lacking important nutrients that prevent tooth decay and gum disease, such as iron, calcium, and vitamin B. They may also experience dry mouth and swollen saliva glands. 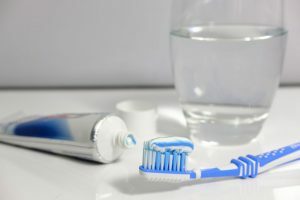 People who suffer from bulimia may show signs of frequent vomiting by the acid erosion on the back of their front teeth as well as weak teeth overall. Celiac disease is commonly associated with gastrointestinal issues, but the teeth and mouth are also common indicator spots. If your dentist notices yellow or brown spotting on your teeth, pitting and groves on the teeth, or an unusually smooth tongue, they may suggest you get tested for Celiac disease. Low bone density is a common indicator of osteoporosis and dentists help patients become aware of this health concern all the time. Since you are already getting dental X-rays done to check the structure of your teeth, dentists are also able to see the density of the bones that connect to your teeth. They may also notice other symptoms, such as receding gums and loose teeth. Interested in Receiving Quality Dental Care? Receiving quality dental care is not only crucial for the health of your teeth, but for your overall health as well. Dentists can tell a lot about your health and potential diseases from the symptoms that display in your mouth. It’s like a two-for-one deal – you can get your teeth cleaned and your mouth assessed for potential symptoms in the same appointment. If you are interested in getting your teeth cleaned or any other dental services, reach out on our contact page. We would be pleased to help you.